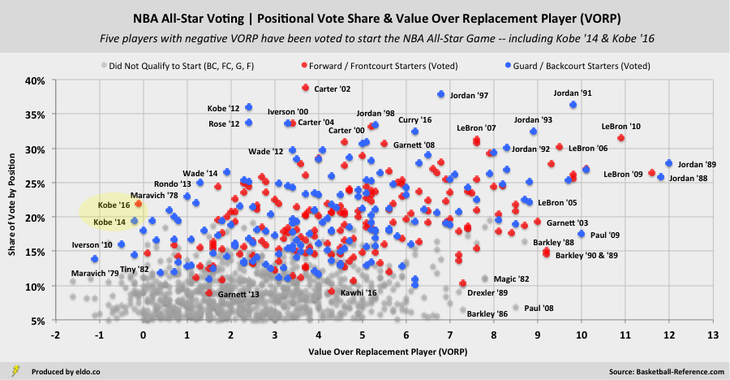 As you work your way up and to the right, you can see which players – Rondo, Wade, Rose, Bryant, Iverson, and Carter – received high vote shares (25%+) with relatively low VORPs. Michael Jordan and LeBron James dominate the top right of the chart, with all-time great seasons and high vote shares in their respective primes. And toward the bottom right, historically great seasons by Paul, Garnett, Barkley, and Magic were not rewarded with a ton of votes – or in some cases a starting spot. Whereas there is some relationship between VORP and votes for guards and forwards, there is no such relationship for centers. Excellence has been ignored and mediocrity has been rewarded. 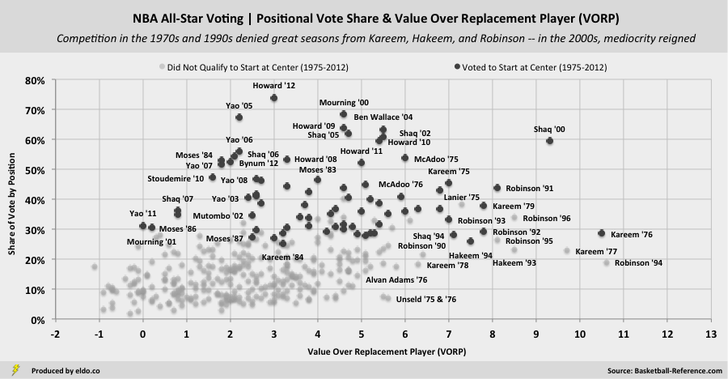 In terms of VORP, Kareem Adbul-Jabbar and David Robinson are the Jordan and James of their position, albeit with less vote recognition from fans. Meanwhile, Yao Ming rode the international vote and Dwight Howard, Ben Wallace, and late-career Shaq rode a lack of competition at the position to high vote shares in mediocre seasons. Note that VORP is a little less kind to centers than is PER. While centers’ PERs were crowded toward the right side of the very first chart in part one (with Shaq shining), their VORPs are clustered toward the left side here. Also note that starting centers generally capture a greater share of their position’s vote (~40%) than do guards or forwards (~20%). That's because vote shares are calculated within the top tier of each position; for centers that means votes received as a percentage of the top five, whereas for guards and forwards it's votes received as a percentage of the top ten.